What markets expect of Wall Street earnings season? We are already more than two weeks into a new quarter and the Wall Street earnings season has just begun! Major US banks like JP Morgan (JPM.US) or Wells Fargo (WFC.US) launched the marathon on Friday with the release of their reports. However, earnings estimates are much more downbeat this time than in the previous quarters. In this short analysis we will take a look at what markets expect of Q1 2019 Wall Street earnings season. It has been a while since we saw such a strong first quarter of the year on the US stock market. The S&P 500 index (US500) moved 13.07% higher in the January-March period and it has been the best Q1 for this index since the first quarter of 1998 (+13.53%). However, was this driven by the improvement in companies’ operations or was it just a long corrective move following steep declines in the final quarter of 2018? Unfortunately, analysts’ views seem to support the latter option. Estimate for the S&P 500 comprised of median estimates for individual companies hints at earnings drop of 4.3% YoY at the index level. 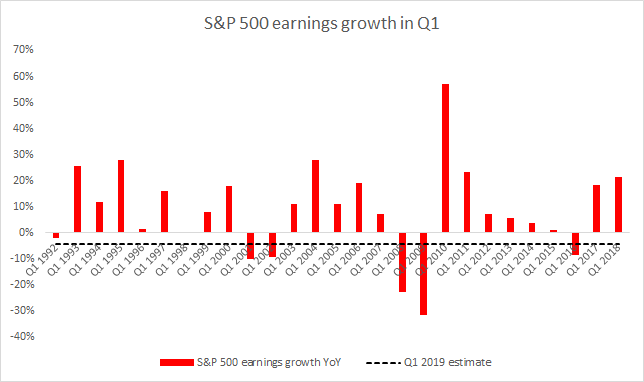 Note that at the end of 2018 analysts expected S&P 500 earnings to grow in the first quarter of 2019 by 2.8% YoY. 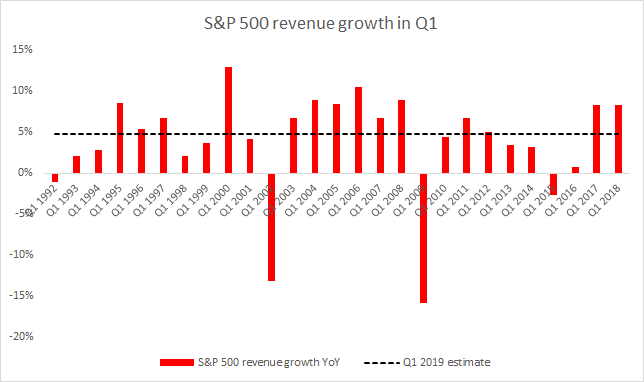 In case current estimates turn accurate it will be the biggest annual decline in earnings since the first quarter of 2016 and the first one since the second quarter of 2016. Investors who compare the aforementioned estimates with the actual earnings growth rates in 2018 (>10% YoY in each quarter) may conclude that something terrible must have happened during the past three months. While geopolitical developments could have played their toll on results of the US companies in the Q1 2019, such a reversal in the earnings dynamics is actually due to more domestic-nature factors. Namely, a boost from the US 2017 tax overhaul faded with the end of 2018. Having said that, from now on earnings growth rate will more closely resemble the operational reality of the company rather than favourable changes in tax law. Among sectors that are expected to experience a double-digit earnings declines one can find energy, materials and IT sectors. On the other hand, only four sectors are expected to see their earnings increase with utilities being the leader (+4.7% YoY). However, as we ruled that a U-turn in earnings’ dynamics is mostly due to the unfavourable base effect it may be wiser to focus on revenue growth. Things look a bit more optimistic in this case as S&P 500 sales should grow by 4.8% YoY at the index level. Such a result would mark the worst quarter in terms of revenue growth since the third quarter of 2016 (2.7% YoY). However, it should be noted that the growth of 4.8% YoY would be in-line with average and median growth rates for this decade (4.57% YoY - average, 5.02% YoY - median). Among two sectors that are expected to experience a decline in sales one can find energy and IT sectors. The former is forecasted to report the biggest drop in revenue ( -2.5% YoY). However, it should not come as a surprise given that the quarterly volume-weighted price of WTI was 13.4% lower ( $54.47 vs $62.93) and the price of Brent was 5.24% lower ($63.51 vs $67.02). JP Morgan (JPM.US) and Wells Fargo (WFC.US), who were the first major US banks to submit their reports, both showed better-than-expected revenue but the latter missed earnings forecasts. Today investors were offered financial reports from another two banks, Citigroup (C.US) and Goldman Sachs (GS.US). Citigroup saw its earnings beat market consensus while revenue came in line. However, majority of the EPS growth was due to smaller amount of shares outstanding. When it comes to results from Goldman Sachs we also saw a beat in earnings but revenue disappointed. Goldman noted that its equity trading segment disappointed and warned that the remainder of the year may be weak. While a number of factors may make the company beat or miss analysts’ consensus, it should be noted that a common theme can be found in the already released reports. More than half of around 30 companies that have already released their reports pointed to FX headwinds when explaining what had a negative impact on the results in the previous quarter. Last but not least, below we provide you with a calendar of key earnings releases for the next two weeks.